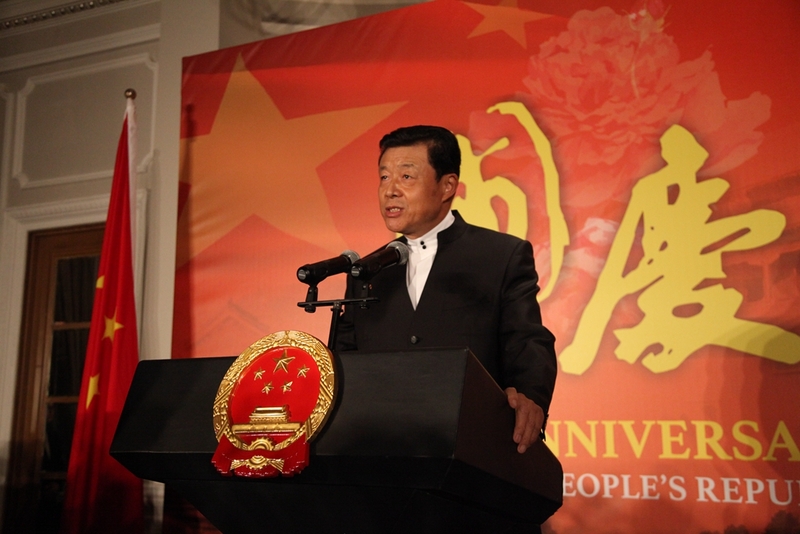 Welcome to the Chinese National Day Reception. 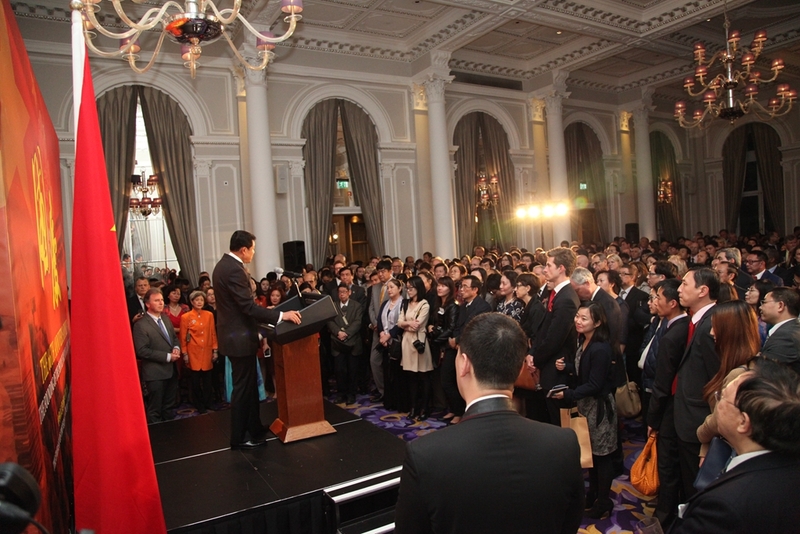 We are delighted to have you all with us to mark the 66th anniversary of the founding of the People's Republic of China. As earth's condition is receptive devotion, a gentleman should hold the outer world with broad mind." China's progress in the past year proved how relevant these lines are. China steadfastly adhered to the path of peaceful development. This means that China strived to foster a community of development and shared interests with countries of the world for win-win, inclusive and common progress. And, China will strengthen all-round Party discipline. China moved ahead with the initiative of 'One Belt, One Road'. This initiative will bring China into global cooperation on production capacity. It will offer huge opportunities for the world to share. China hosted the successful 22nd APEC Economic Leaders Meeting. The meeting adopted the 'Beijing Roadmap' and gave a powerful boost to the idea of FTAAP, short for Free Trade Area of the Asia-Pacific. China initiated the Asia Infrastructure Investment Bank, or AIIB for short. This brought together 57 countries in and outside the region. Britain was the first developed country to become a founding member. The AIIB will be an effective platform for inter-regional infrastructure development and connectivity building in Asia. And it will help deepen regional cooperation and promote common development. China marked with a grand commemoration the 70th anniversary of the victory of the Chinese People's War against Japanese Aggression and the World Anti-Fascist War. That event reiterated the great truth of history that "justice will prevail, peace will prevail and the people will prevail". 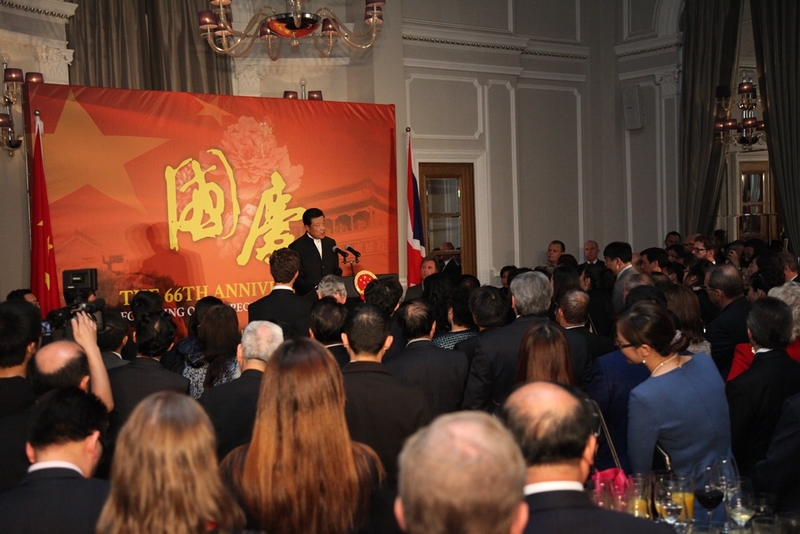 Prime Minister Cameron sent his special envoy to join the Chinese people in commemorating this important anniversary. Beijing's bid for the 2022 Winter Olympics was a resounding success. Beijing will become the only city in the world that has ever hosted both the summer and winter Olympics. And Beijing also presented an excellent and unforgettable 2015 World Athletics Championship. I want to take this opportunity to congratulate Team GB on its excellent performance in Beijing. China is adapting to and working along with the economic new normal. China is taking measures of creative macro regulation that are targeted, discretionary and precise. China is introducing new reforms into the economy where greater dynamism is needed. And China is constantly pushing for mass entrepreneurship and innovation. The ups and downs in the economy may have formed the shape of a curving wave, but the underlying trend remains to be positive. Despite the moderation in speed, the Chinese economy is stable. It is moving in a positive direction, and it is making progress. China has achieved 7 percent growth in the first half of this year. This is not at all easy and it is a progress we are proud of. Not long ago, Her Majesty The Queen became the longest reigning British monarch. Around the same time, I have the pleasure to become the longest serving Chinese Ambassador to the UK! Over the past five years, my colleagues at the Embassy and I have worked closely with our British friends from all walks of life. Our joint efforts have resulted in steady growth of China-UK relations and close cooperation in various fields. I believe we should all take special pride in the fact that China-UK relationship is embracing a 'golden year' of 2015. This 'golden year' features frequent high-level visits, fruitful economic and financial cooperation, and flourishing cultural and people-to-people exchanges. Indeed, 2015 is a 'golden year' of unprecedented high-level visits and dialogues. Earlier in the year, The Duke of Cambridge paid his first-ever visit to China. This was the most important royal visit to China in nearly 30 years. In June, shortly after the election here, Chinese Foreign Minister Wang Yi came to establish early contact with the new British government. June also witnessed visits by Secretary Meng Jianzhu, special envoy of President Xi Jinping, and Secretary Guo Jinlong of Beijing Municipal CPC Committee. In July, Rt. Hon. Oliver Letwin, Chancellor of the Duchy of Lancaster once again visited China. In August, Secretary Hammond visited Beijing for a new round of China-UK Strategic Dialogue with State Councillor Yang Jiechi. Last week, Vice Premier Liu Yandong came to London to co-host the Third Meeting of the High-Level People-to-People Dialogue. And this week, First Secretary and Chancellor George Osborne has been in Beijing, where he co-hosted the Seventh Meeting of the Economic and Financial Dialogue. 2015 is also a 'golden year' of striking economic and financial achievements. In the first half of this year China-UK trade in goods totaled 36.74 billion US dollars. China is now the UK's fourth largest trading partner in the world, and Britain is China's second largest trading partner in the European Union. Britain is China's number one investment destination in Europe. The total investment stock stands at over 40 billion US dollars. As a step forward in China-UK financial cooperation, the first RMB denominated money market fund was listed in London. China and the UK are also exploring the opportunity to pool their respective strength and dovetail their respective development strategies. These include China's 'One Belt, One Road' initiative and Britain's National Infrastructure Plan and Northern Powerhouse strategy. As of 2014, Chinese direct M&A in the UK amounted to US$7.1 billion and investment stock stood at over US$40 billion. These investments covered a wide range of fields, from infrastructure, commercial property, brand network to R&D centres and high-end manufacturing. I believe the history books will record 2015 as also a 'golden year' of flourishing cultural and people-to-people exchanges. 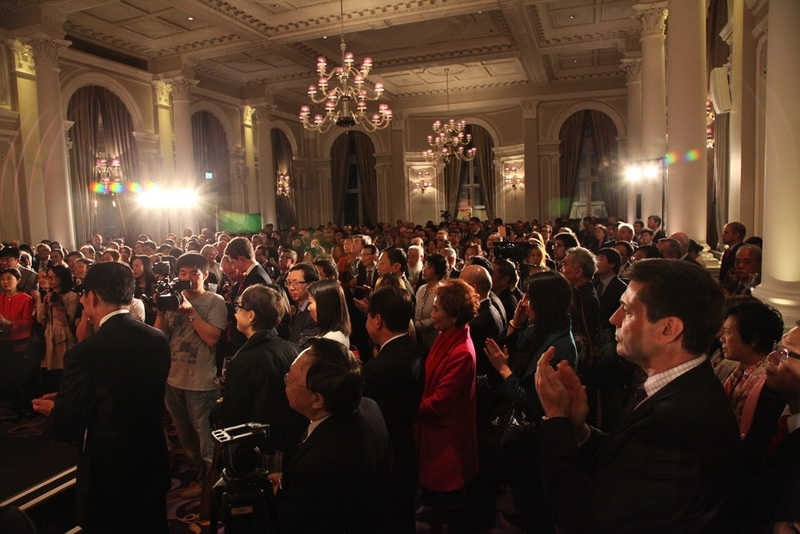 2015 was designated as the Year of China-UK Cultural Exchange. The UK Season in China, which lasted from January to June, was a resounding success. Unique British creative industry enjoyed full exposure to the Chinese public all over the country. To begin with, the National Theatre of China brought the Chinese version of Richard III to London in July. In August, the PLA Military Band and the Zhejiang Changxing Lotus Dragon Art Group put on an amazing show at the Edinburgh Military Tattoo. This month,Chinese creation, Chinese design and Chinese fashion lit up the stages of the London Design Festival and the London Fashion Week. At the Third Meeting of the China-UK High-Level People-to-People Dialogue concluded just last week, many productive outcomes were achieved. These include programmes of exchanges and cooperation in a wide range of areas, from culture, education, science, technology and health, to sports, tourism, youth and local government. In the 'golden' month of October, at the invitation of Her Majesty The Queen, President Xi Jinping will pay a state visit to the UK. This will be the first state visit by the Chinese president in a decade. For China-UK relations in the new era, this visit is a significant event and joyous occasion that deserves grand celebration. It will mark a new milestone and herald a 'Golden Time' for China-UK relationship. I therefore call on all of you to join hands and redouble our efforts. Working together, we can ensure that President Xi's state visit will be a successful one. Working together, we can contribute to China-UK relations and embrace the 'Golden Time'. To the 66th anniversary of the founding of the People's Republic of China! To a successful state visit to the UK by President Xi Jinping! To the 'Golden Time' of China-UK relations!